"We found Karl from internet searching. He has built us floor to ceiling cupboards, a desk, and some floating shelves. He followed our specification very carefully and consulted with us the whole way along. He also made some suggestions which have really improved the final look. He was tidy when installing the cupboards and cleaned up as he went along. We are very impressed with the quality of his work and it has exceeded our expectations, so we are very happy to recommend him." "Karl was recommended to me, he made a wonderful job of our bedroom cupboards. He is totally reliable and trustworthy. We just gave him a key and let him get on with it. He does exactly what he says he will." "Karl has worked for us twice now. He has made alcove cupboards and shelves, and a window seat. His work is excellent and is a really nice person to have around." 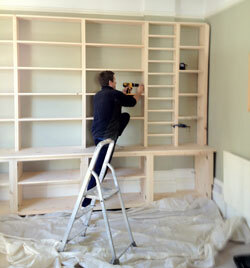 "Karl has done solid wooden shelving for me in my old house in 2003 and my new house in 2008. He specialises in this area, so knows exactly what you want and does a great job." "I had a vague idea of a coffee table with storage. Karl was great at asking the right questions and turning my ideas into a lovely coffee table, exactly what I wanted." "Karl made some solid oak bookcases for us . He listened and carried out the work exactly as we wanted and was patient when we changed our minds about the spec. We were very pleased with the end result and would definitely recommend him to other chambers."